DB Sports Tours is always looking to break boundaries and recently we brought the Academy Director of Portuguese giants SC Braga to Ireland for a special week-long coaching clinic road show. 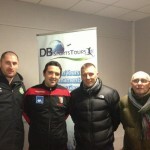 Hugo Vicente is no stranger to Irish football after his successful brief visit to Ireland at the start of 2012 to work with West Dublin club St Francis. So, we were delighted to be able to invite coaches from Dublin and Limerick to get a real opportunity to learn from Hugo’s expertise last month. Between four different venues in Leinster and Munster, we were delighted to give over 300 coaches and almost and 150 players the opportunity to work with this talented individual at the forefront of continental coaching. For anybody who was not lucky enough to have gotten out to see Hugo in action we wanted to (1) assure you there will be plenty more exciting similar events brought to you in the future by DB Sports Tours and (2) here is a taste of the philosophy you might just see creeping into a few clubs in Dublin and Limerick lately. WARM-UP – Jogging is for treadmills. The first thing that Hugo briefed each and every coach on before they even stepped on the training pitch is that HIS METHOD is not the conventional one – but it works for his club, so he is happy to advocate it. The warm-up is a source of great debate amongst amateur coaches in Ireland (Do you use a ball? Should it be structured or unstructured?) but coaches at the clinic were shown a rather unique approach to the warm-up. The principle is very basic: the players warm-up by doing the exact movements they will be doing in the session/game in a fun game format. So for this drill, 5 V 3 PASSING GAME warm-up with a basic piggy in the middle possession game involving five players in possession (four on the outside of the box and one as a link/midfield player) keeping the ball from three pressing/defenders. One added stipulation is that a ball has been placed on a marker in the centre of the box and must be hit by the team in possession. If the three players in the middle win the ball back without forcing it out of the assigned grid they can try to keep it as the outside players come into the box to press themselves to win it back. BUT, most importantly, the players learn while ENJOYING A COMPETITIVE GAME (a bored player does not learn). As the objective of the whole session is to enhance the player’s use of space through their control of the ball and combinations this is a unique way to keep the conditions of the game constantly changing and forcing the players to adapt constantly and find new angles of attack. Splitting the group into two teams, four players are assigned the jobs of splitting into pairs and carrying two poles around the box in an effort to avoid both teams putting the ball through the gap between the pair and the pole (for the purpose of the game, the goal). To traditionalists this may seem like pure chaos in a box but as Hugo points out, a game is not a controlled environment – it is a fluid environment where players must constantly be able to adapt, think and solve problems, ie, how to break down a defense. Again the emphasis is on creating an environment as similar to the game situation as possible. A basic possession drill with two teams battling to simply keep the ball and counting passes works on just that – building up passing numbers – but in a game possession only serves the purpose of working an opportunity to score/shoot so a target is extremely important for the players. Again, the players learn while ENJOYING A COMPETITIVE GAME (a bored player does not learn). Every player likes nothing more than a game at the end of every training session, so why not give the players want they want while still working on some game-related areas. This practice once again allows the coach to work on possession, with two teams V one (each of three teams in a different color to allow quick transition from attacking to defending if you lose the ball). The difference between this drill and a traditional possession one is that there is a full-size goal in a position that makes it a microcosm of the midfield battle leading up to an attack. By forcing the team in possession to work enough space to play a pass through a designated lane towards goal and release an attacking player on goal it makes the drill even more game related. By allowing one defender to follow the winger/ attacker through the gate it cuts out the obvious outcome of the team in possession always scoring at will with easy one v one finishes beyond the goalkeeper. Of course, it is called Release the Wingers, so the coaches main focus is the movement of his attacking wing players and teaching them how to take up a relevant position when their team has worked a good position through possession. Just to mix it up we are going to leave it up to you – the readers – to decide exactly what the purpose of this game is and how it can be used by the coach. We are asking you to leave a comment on our Facebook page on your interpretation of the drill and the benefit it to a coach – along with your email address. Hugo himself will look over the comments and the one he likes the most will be emailed an exclusive session planner – not used on either of this trips – for their folder.